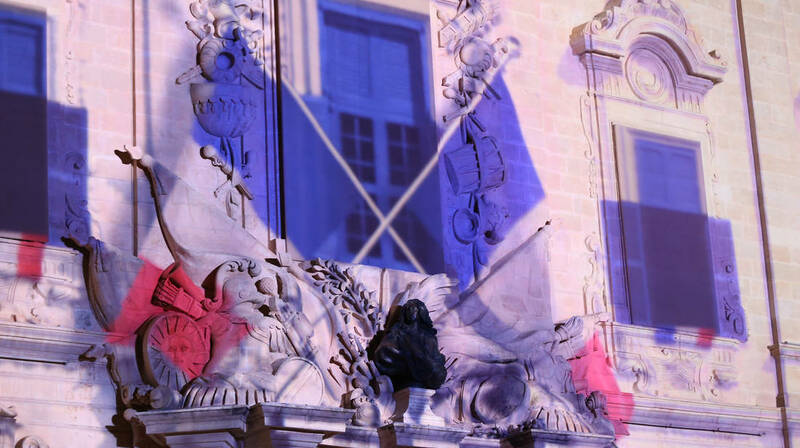 In Castille Square, the façade of the Auberge de Castille became a canvas for an innovative digital projection titled, Minn Qiegħ l–Imgħoddi għall-Quċċata tal-Ġejjieni (From the Depths of the Past to the Heights of The Future). This twenty-minute 3D mapping spectacle was designed by Duane Laus, one of Malta’s foremost digital artists, accompanied by original music by Paul and Ryan Abela. Combining CGI components, music and visual special effects, Laus’ displays created a multi-layered narrative that acted as a tribute to an oft-forgotten side of the Maltese story – the history of the people, the unknown, and the unsung. On the night, a 3D motion capture mermaid representing Malta lead audiences through a short timeline projected onto the façade of the Auberge de Castille. Together with a narrator who interjected with a series of stories or anecdotes, our mermaid guide travelled through 40,000,000 years, up until the present day, after which she finally delved into a surreal future. Minn Qiegħ l–Imgħoddi għall-Quċċata tal-Ġejjieni was a visual celebration of Malta’s past, that looked ahead to an imagined future, thus consolidating the common theme that ran through the four spectacles taking place in four different squares in Valletta. The spectacle painted a living image of Malta’s rich past and contemporary life, which foregrounds moments of wonder, calling for Maltese identity to return to communal expressions of solidarity and simple gestures. Going back to the message in its title, the show in Castille Square looked to the future with hope – to the brightness of an imagined future where the nation decided to put its differences aside for a fleeting moment and join in a celebration of the unique heritage and character of the Maltese Islands.